Arrogance of Chinese girl who threw taho at MRT police could indicate foreign group's sense of entitlement in our own country. Why the big hoopla over cleaning up Manila Bay when reclamation projects certain to pollute the Bay's waters are already approved, per PRA's testimony in the House? What happens to world's most beautiful sunset when casinos shoot up? Beautiful Manila Bay with its world-famous sunset is threatened with reclamation projects. The Chinese girl's arrogance toward the MRT policeman---splattering taho at him when he forbade her to bring her drink into the train---is merely symptomatic of what's reputed as the Chinese invasion of the country. I have been riding taxis since I lost my driver and invariably I strike up conversation with the drivers---as they have always had their pulse on what's cooking in town. One cabbie commented that this taho episode is not surprising, as the Chinese girl's compatriots are now all over the metropolis. Perhaps they think they own the Philippines now, he asserted. In fact, one cabbie pointed out that whole villages are being built for the Chinese south of the metropolis, and as everyone knows, they have been buying or leasing condominiums all over the Greater Manila area, driving up condo rentals for the locals. In Facebook a woman wrote with ill-disguised irritation that when she brought her child to the emergency room of a downtown hospital, it was crawling with Chinese children and she could hardly be attended to. Others ascribe the current acute shortage of drivers, housemaids and office staff to the hiring of these personnel by Chinese corporations that have set up here. The latter are reported to be paying far higher wages than Filipinos. It had long been the talk in town, corroborated by the Bureau of Immigration, that Chinese workers have been entering the country in droves, as they are setting up companies in various parts of the archipelago---especially in the industrial zones. The query in many minds: are they all properly documented? The problem here is that while we welcome foreign investments into our country, under normal circumstances and as demonstrated by other foreign nationals, only the top officials are foreign nationals---the rest of the staff and workers would be Filipinos. This does not seem to be the case with the Chinese, who insist on bringing their own people by the hundreds and thousands. This explains why exclusive enclaves of the Chinese are going up in various parts of our country. Do our leaders know what's happening, and is this seeming mass Chinese invasion part of a deal of sorts? On another front, recall that there was a big hoopla in past weeks about the clean-up of Manila Bay, with lots of young people and various NGOs volunteering in this laudable project. Recall too, that various business establishments said to be polluting the historic bay have been admonished and some, like the Aristocrat Restaurant on Roxas Blvd., were even suspended from operating until they fix their environmental compliance. The project to clean up and save the Bay drew so much enthusiasm as most Metro Manilans feel sentimental about Manila Bay and watching its world-famous sunset has been a generational past-time. But alas, like many things in this country, all the ballyhooed clean-up may come to naught. In a hearing last Tuesday at the House of Representatives, Joseph Literal, Philippine Reclamation Authority (PRA) assistant general manager for reclamation and regulation, told shocked congressmen that his agency is currently processing applications for 22 reclamation projects in Manila Bay that would likely affect some 22,000 hectares of our historic bay! Once approved, the projects would affect about 11% of the bay's 1,994 sq. km. area, doubtless in a manner that could compromise environmental sanitation! Other sources actually say that the total reclamation projects in Manila Bay number 43!. PRA Assistant GM Literal also stressed that these 22 (or 43?) projects scheduled in the metropolitan area are only part of some 120 reclamation projects in the whole country. Literal also admitted that of the 22 reclamation projects lodged before his agency, three have already been approved in principle---after the developers were said to have complied with Department of Environment and Natural Resources regulations. These are the 360-has. Pasay reclamation project, the 140-has. Solar City project, and the Navotas Boulevard Business Park. Among the most shocked solons at yesterday's hearing on the Bay's reclamation projects was former Manila Mayor and former Environment Secretary, now Buhay Party-list Rep. Joselito Atienza, who raised possible adverse effects of these projects on the environment. Anakpawis Rep. Ariel Casilao joined Rep. Atienza in grilling the PRA official. To Atienza's query on the possible ill effects of these reclamation projects on the environment, the PRA official admitted that there will be an effect, but he stressed that " 'systems' " would be put in place to reduce the environmental impact of the reclamation projects." and yet you will still let these projects proceed---and just try to mitigate these adverse effects?" The former Manila Mayor stressed that "the effects will be catastrophic for all of us," beginning with the rise in sea levels. Atienza decried the "reclamation craze sweeping across the country which the PRA seems to just keep approving and approving without due diligence." Anak-pawis Rep. Ariel Casilao, on the other hand, stressed that the reclamation of Manila Bay ought to be stopped as "it's threatening the genuine essence of its clean-up, so that it must be opposed." Indeed. As a way to mitigate adverse reactions, Interior Secretary Eduardo Ano has stressed that all reclamation projects would be reviewed, but what complicates the matter is that according to recent news reports, the Office of the President has taken DIRECT CONTROL AND SUPERVISION over the PRA and its 43 reclamation projects in Manila Bay. Thus, the DILG appears to have been sidetracked in this issue. In fact, the Inquirer carried last Tuesday a news item that one project in the Manila Bay Area has already been awarded to Dennis Uy, a businessman from Davao with close ties to President Duterte. His project involves 265-hectares of the Bay, called the Pasay Harbor City, estimated to cost some P62 billion. I'm afraid that the side-tracking of the PRA in this issue would only worsen the environmental state of storied Manila Bay. It also does not encourage a picture of integrity for the Office of the President. The query that will be left in citizens' minds: who stands to make money on these projects? From various write-ups, we are given to understand that multi-function reclamation areas similar to those in cities like Dubai are being considered to be set up in Manila Bay, and presumably these would involve casinos, night-clubs and other high-end entertainment. All these big-ticket reclamation projects would naturally involve enormous funds, some of which could be generously funneled to cooperative politicos in various areas, especially in this campaign season. 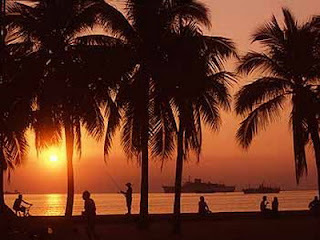 But we citizens go back to the question: what is to happen to the historic Manila Bay, which has seen many a battle in our history and which boasts the most beautiful sunset in the world? The island of Corregidor, bathed in the blood of Filipino and American defenders during World War II, is part of the proud history of Manila Bay. What was the much ballyhooed clean-up of Manila Bay---designed to benefit families---all about, if in the end it's just going to be polluted by reclamation and establishments that could cater mainly to gambling and other vices to be set up there? Who stands to profit from all these reclamation projects? We're already certain about the losers: it's the Filipino people. Senator PanfiloLacson morphs from a highly controversial cop in past decades to today's highly effective conscience of Congress especially on embedded porks in the budget. 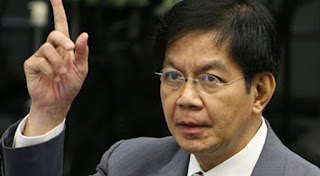 That Senator Panfilo Lacson has emerged as effective conscience of the Senate is quite interesting, considering his colorful career as controversial cop in past decades. Lacson has been scrutinizing, line by line the proposed P3.9 trillion draft-spending bill f government for 2019, now being finalized by the Senate conference comitttee headed by Sen. Loren Legarda. Because of his studiousness in questioning budget data he considers "suspicious pork" (officially referred to as "Priority Development Assistance Fund"), Lacson is given by media all the attention he needs nowadays. Lacson's assiduousness in tracking down pork insertions has kept his fellow senators not only on their toes, but also quite irritated with him. In fact Senate President Vicente Sotto III threatens to pull out the current budget bill, so that prospects of a "reenacted budget" looms---something undesirable in an election year. Obviously it is oblique criticism of Lacson's incessant sleuthing about the PDAF, which was ruled unconstitutional by the Supreme Court in 2013 but which constantly morphs in different forms in Congress. Just this morning (Friday, Feb. 01, 2019), the Inquirer bannered Lacson's revelation that each House member will get P100 M, as embedded in the National Expenditure Program prepared by the executive department, to which, Lacson alleged, Speaker Gloria Macapagal Arroyo added P60 million more for each of her House colleagues. Lacson has been scrutinizing the 2019 budget especially for gargantuan public works projects, which are the traditional milking cows of both houses of Congress. Lately he has been targeting a favorite source of pork funds over various administrations---the multi-billion funds for dredging and flood control projects. As a pundit remarked, it's easy to finagle funds for these projects as they are literally washed away---no trace whatsoever. Recently Lacson trained his guns on unfinished road projects in various areas, notably in Batangas and Bicol. It turned out that many big-ticket highway projects remain unfinished because of one pathetic and lamentable reason: some simple folks who own small land parcels that have been expropriated by DPWH to make way for these grand highways HAVE NOT BEEN PAID FOR THEIR SMALL PARCELS---despite the huge amounts programmed for the "Build, Build Build" road projects of the Duterte administration. What's even more disturbing is that while construction of many highways remains unfinished because of this expropriation problem, in many cases FUNDS HAVE ALREADY BEEN PAID TO CONTRACTORS, WHO, IN TURN, HAVE ALREADY GIVEN COMMISSIONS TO POLITICIANS IN THOSE TERRITORIES WHERE HIGHWAY CONSTRUCTION HAS STALLED. The Inquirer posed photos recently of a number of cases where highways lead to nowhere---because the contractors failed to pay the humble owners of tiny parcels of the huge land appropriated for the highway! In a recent interview, Sen. Lacson was asked if the senators' "individual amendments," amounting to P23 billion in the 2019 spending bill, could be described as "pork." He was quoted as asserting, "That is a very fair statement. If something was allowed, then there was horse-trading. That's unfortunate in our budgeting process." Lacson also stressed that such revelations deprive the Senate of any moral ascendancy over the House of Representatives. His statement tallies with House Appropriations chair Rolando Andaya Jr.'s assertion in a recent Inquirer banner story that lump-sum amendments introduced by the Senate exceeded P190 billion, whereas the House proposal involved only P51 billion----A HUGE DISCREPANCY IN PORK BARREL PROJECT PROPOSALS. .
What;s interesting is that Public Works Secretary Mark Villar had admitted that the additional P75 billion in the DPWH budget that Lacson "stumbled upon" was NOT PART OF THE DPWH'S REQUEST. If Villar didn't ask for that additional P75B, who did? A clear whodunit case! Banner stories about Lacson's assertions of heavy pork embedded in the 2019 spending bill constitute only part of the evidence of his amazing transformation from his earlier years---when he was linked to various controversies---to his current role as crusader vs. pork. One such controversy involved his alleged master-minding of the infamous "Kuratong Baleleng" gang, that eventually led to his flight from the country and his self-exile for 15 months. Among the controversies Lacson was linked to as chief of the Presidential Anti-Organized Crime Task Force (PAOCTF) was the disappearance of publicist Salvador "Buddy" Dacer and his driver Emmanuel Corbito in 2009. Upon Lacson's return from his self-imposed flight abroad, however, the Court of Appeals in February 2011 withdrew the murder charges against him as filed by Mancao, ruling the latter a non-credible witness. Since his election to the Senate in 2001 under the LDP affiliated with President Estrada, Lacson has been exposing the evils of the pork barrel system and calling for its abolition. But pork appears to be too deeply imbedded into the body politic that it would take more than his exposes to surgically excise it. Thus, the recent admission of DPWH Secretary Mark Villar that the additional P75 billion in his department's budget this year WAS NOT PART OF THE DPWH'S REQUEST only accentuates the fact that in this election year, congressional politicians have to get their generous share of the embedded pork to fund their campaigns. It is a fact, indeed, that local elections involving representatives and local offices oftentimes prove far more expensive than national elections, such as for senator. The fight is far more intensive at the local level---thus, more funds needed. Bureaucratic corruption has become so ingrained int our political system, but it's brought to newer heights during elections, when voters expect to get grease money in exchange for their votes. Selling votes during election time is doubtless the citizens' revenge oftentimes on their politicos' negligence of their welfare. Until such time when the broad masses are rescued from grinding poverty and their educational level is raised by dint of duly compensated hard work---as well as when a more compassionate, caring and honest government emerges---many citizens' votes will tragically remain for sale to the highest bidder. The elected officials, with some exceptions, will then seek to recoup their "losses" through corrupt practices such as pushing substandard public works projects with fat kickbacks---and cementing their dynasties with these funds. A vicious cycle indeed. Let's pray and work for better political times.